The Emoji phenomenon continues to evolve and grow. Apple releases a new phone and magically, the emoji universe explodes. Emoji Pop Quiz takes common popular references and turns them into emoji clues. Your objective is to see the emoji and guess the puzzle phrase. If you are successful you earn bananas, which I find humorous and a nice change from coins or money. The Game Center achievements are fun and I find myself playing this game when I’m waiting in line at the grocery store or pumping gas. This is a perfect time killer for quick errand runs or when you need to do something different than your normal 9-to-5. If you dig emoji and like the clues, this game is a lot of fun. I think my only complaint would be that there isn’t a backspace button on the mini keyboard. The graphics flow nicely and I enjoy this game, nonetheless. Check it out and tell me what you think! 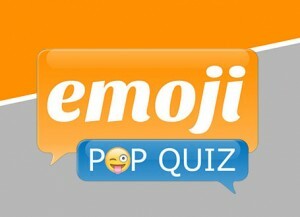 Emoji Pop Quiz for iOS devices at the App Store. Emoji Pop Quiz on Facebook for desktop and laptop users.